As many folks have discovered, riding a fat bike is really fun. 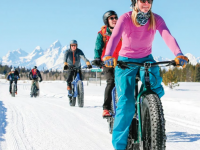 The popularity of fat biking has grown quickly in the past few years and fat bikes have become ubiquitous on most of the winter trails in the area. Many of the Jackson area trails are multi-use with hikers, dogs, skiers, snowmobiles and fat bikers all recreating in close proximity. With the privilege of using the trails comes a high level of responsibility for all users in order to avoid conflicts. – Bikes yield to all other users. When a cyclist approaches another user it is important to remember that the user has the right-of-way. Say “Hello” and let other users safely pass. – Slow down in congested areas. Popular trail heads can get crowded. Cyclist should ride slowly or consider walking their bikes when other users are present. Also, while out riding the trails, remember nordic skiers may require a wide lane. Cyclists should signal skiers before passing to prevent collisions. – Ride when the trail is firm. Do not ride when the trail is soft and you are leaving ruts 1″ or deeper. This damages the groomed trail for all users. Tires of 3.8″ or wider should be used and it may be necessary to drastically reduce tire air pressure to minimize ruts and increase traction. 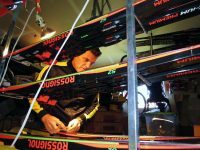 – Don’t ride in the classic skier track. – Consider turning around or riding alternate routes if wildlife is present. Winter is extremely difficult on wildlife and there is no excuse for stressing animals just to ride our bikes. – Know where you are riding and make sure fat bikes are allowed. Although many of the groomed trails and forest trails are multi-use and allow fat bikes, there are exceptions. 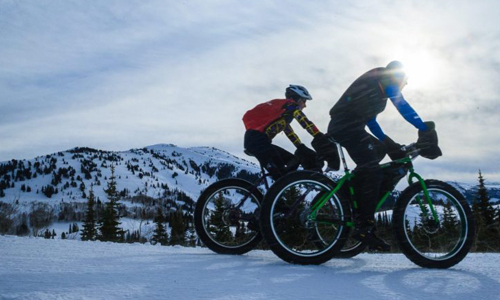 Areas such as Trail Creek and Teton Pines are skier-only and off limits to fat bikes. 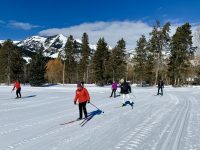 Also, Grand Teton Park does not allow winter use of fat bikes along the main groomed track between the Bradley/Taggart and Signal Mountain Lodge gates. – Over 40 fat bike trails are listed on JHNordic.com/Trails page -click the “fat bike” icon, then hit “search ” to list all 40+. You can also search by region, distance, difficulty, dog-friendly. 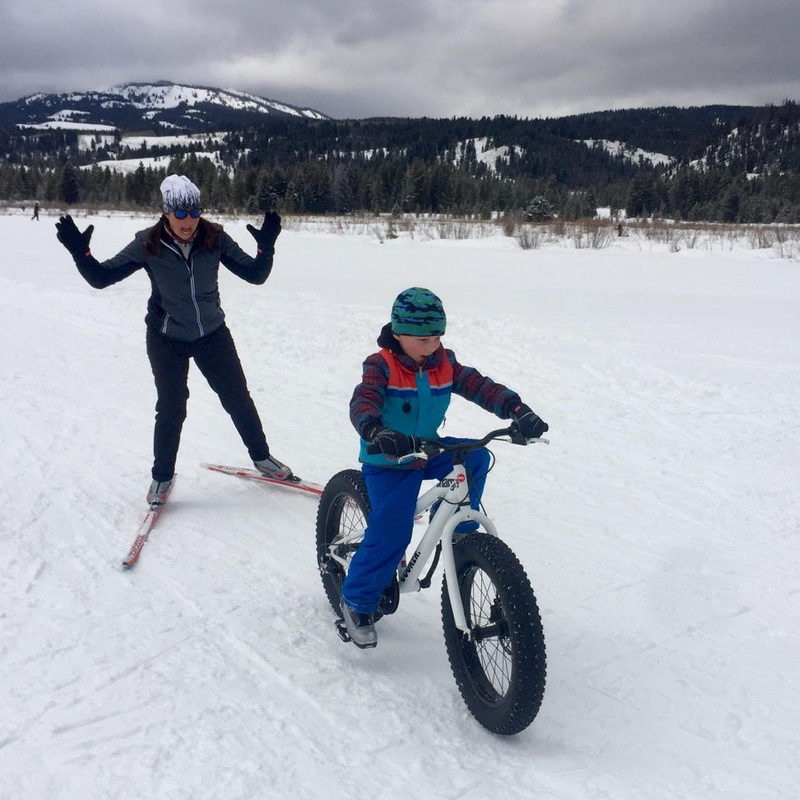 Most of the snow-mobile groomed trails in areas such as Togwotee Pass and the Gros Ventre road allow fat bikes, as does Turpin Meadow Ranch. 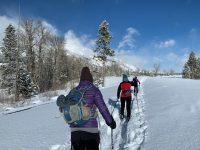 Nermo and Lady Slipper near Teton Springs, Grand Targhee, and Teton Canyon are all excellent quality groomed trails for fat biking in the region. Electric/pedal assist bikes are becoming more common; however, E-bikes are classified as “motorized vehicles” and are subject to the rules that govern motorized use on forest roads and trails. They are not allowed on the designated “non-motorized” single track & trails around the Jackson front country, which includes the Old Pass Road and all trails and groomers in the Cache Creek and Game Creek drainages. Fortunately, they are allowed on most forest service groomed snowmobile trails (purchasing a $35 snowmobile registration sticker is highly encouraged if you ride the snowmobile trails). Now its time to get out and responsibly enjoy all the amazing fat-bike opportunities we have in the Jackson area.